How would you define in one sentence Champagne Jean Josselin? “A champagne you can shake by the hand.” In other words, approachable, friendly, easy, comfortable. What does the status “independent winegrower” mean for a farmer in champagne? An independent winegrower produces his champagne or his wine with the fruit of his cultivation, from his own lands. must be an independent winegrower, making the wine and marketing his own products. must not market a volume of elaborated bottles produced as a cooperative representing more than 5% of his sales volume. must not market as a wholesaler more than 5% of his sales volume, and this in the context of home or family. must not be involved in an active and professional manner as a wholesaler in more than 5% of his sales volume. a wholesaler must not be involved in a professional and active manner in more than 5% of the business. must press his harvest on his own winepress or that of a winegrower corresponding to article 1.
if he is a broker, he must practice the brokerage only on his winepress or under a personal or family title. must adhere to the logo of independent winegrowers, his support must be voluntary. must apply the rules as set down, any deviation being reviewed by the Board of Administration. must pay the fees fixed by the Board of Administration on January 1st of each calendar year, no later than the end of each month. In the absence of payment after this period, the winegrower is considered to have resigned from the association. concerning the activities within the Council or Board, these are not to be missed without a good cause, and not more than three meetings, consecutive or not. if placed as the Chair of the Regional Federation, he must not serve more than two consecutive terms. Can we make a link between the philosophy promoted by the status and quality of your champagne? Yes, of course. First of all, through knowledge of the terroir (soil, exposure, vine), and also his work in the cellar, respecting tradition. The world of champagne is dominated by large groups, is this a danger to you? What is your position in relation to them? On the one hand, we have our identity as a winemaker, the authenticity of the product, a good balance between quality and price, many assets which more and more consumers are looking to find. On the other hand, these houses push us all to become even better. This is especially true in terms of promoting the image of champagne worldwide as a wine for grand occasions, and by developing the best techniques of cultivation and winemaking. Here in Champagne we have an interprofessional organization that works remarkably well. A good balance has been found between growers and wholesalers. Do you think you work differently from the large groups of high reputation, or is it simply two different approaches to a common passion for champagne? More specifically, what is the real difference in level to the final consumer? The work is certainly no different, but the means, yes. When the same man works from start to finish - from preparing the land, to planting, winemaking and marketing - then passion becomes an indispensable criterion. We talk so much of sustainable agriculture, of the environment and organic farming, what is your position on this question? What are the concrete measures that you have set up? What do they bring to you? Viticulture progresses, and winemakers now have the options of numerous certifications: High Environmental Value, Organic Viticulture, Biodynamic , etc. As for us, we chose "Terra Vitis," a reference label, active in several wine regions of France. This is a voluntary labeling, subject to regular audits and scalable to the size of the property. Our commitment is only beginning; we'll be sure to update this section to let you know the different stages and how it progresses. What are the European standards or other standards with which you must comply? This operation was passed onto you by your father, and you will certainly transmit it to your son; what is the difference between the champagnes of yesterday and the ones of today and tomorrow? In the past, the Josselin champagnes were mostly made from Pinot Noir. We expanded our champagne range with a traditional blend of three varietals and our Blanc de Blancs, thus using additional varietals (Meunier, Chardonnay) other than Pinot Noir. 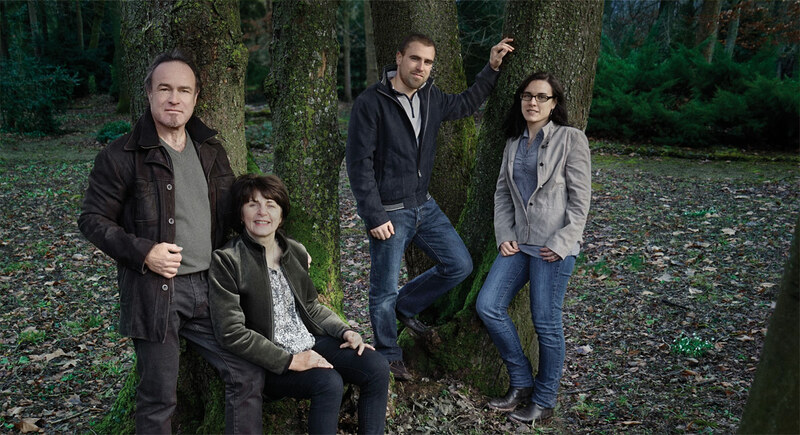 In addition, our son Jean-Félix Josselin joined the family operation in 2010. In 2015, he has created a new cuvée, as yet unnamed, a secret waiting to be uncovered, as many ideas arise and provoke discussion between father and son! The adventure is far from over! Nature changes, the climate changes, the years are different and yet the champagne seems always of equal quality; how do you manage this delicate equation? If our wines seem to you to be of equal quality, it is because Champagne has established a qualitative reserve system (blockage of wine stock) which, by blending the wines of different years, maintains the same style relatively easily. Tell us about your terroir, what is its history? Since when has it produced champagne? Why? How? In application with the law of 1905 on Fraud Repression, the State Council set the boundaries of Champagne winegrowing on December 17th, 1908. The name Champagne was reserved for the Marne and a few districts of Aisne. What that meant is that the winemakers outside those boundaries no longer had the opportunity to sell their wine. This caused an uproar in areas outside those limits which had been selling grapes to the large champagne houses for over 100 years, and which suddenly lost their livelihood. After brewing for a few years, the struggle for the rights to be included in the Champagne appellation exploded in 1911. The fighting ended in 1927 when the boundaries were expanded to include the Aube and other villages throughout the current Champagne region. The culture of the wine was simply a source of income at the time, as in many regions of France. The steep hillsides of our region are intended to be used as vineyards. Since the law was passed in 1927 which broadened the borders of the Champagne appellation, the winegrowers have obeyed the rules of the A.O.C. How does one create champagne? Where do the bubbles come from? How do you make a rosé champagne? Red grapes, white grapes? The harvest, a mixture of pleasure and pain, marks the end of the year’s work in the vineyards and the start of vinification. We establish a circuit of harvesting, as each parcel does not mature at the same time. Regular sampling enables us to mark the development of sugar and acidity in the grapes. This allows us to bring perfectly ripe grapes to the wine press. The manual harvesting done by the harvest workers requires a lot of care and caution. The clusters are fragile, and we keeping the grapes intact is a priority, as the quality of the juice extracted depends upon it. 6. 3rd extraction: removal of sediment after a rest of 2 months, this work prepares the wine for filtration. All these steps contribute to the clarity of our wines, and preserve their aromas. The wine is fragile and requires time to rest between each stage. Transfer by pump is done only when strictly necessary. We vinify the small volume produced by each parcel separately in stainless steel tanks, which allows us to retain the characteristics of each. Then we are able to use this palette to create the most harmonious blends possible. The wine is bottled with the addition of yeast and sugar. At this point, a metal cap is used to seal the bottle. The bubbles which form provoke turbulence in the wine. Thus for a minimum of 24 months the bottles are stored in stacks in our vaulted cave or on a pallet in our climate-controlled warehouse. 10. Riddling: turning the bottle bit by bit and very gently shaking it, allows the sediment in the bottle to collect in the neck. Depending on the cuvée, a cycle of 8 to 20 days is necessary. 11. Disgorgement: in order to do this, the neck of the bottle is plunged into a solution at -27°C, which forms a frozen plug in the neck, trapping the sediment. Upon opening, the internal pressure causes this plug to eject. The champagne is given the final dosage (a blend of sugar and base wine). It’s then corked and the wire cage is fastened to hold in the cork. The drinking habits and tastes of your customers, do they evolve over time? Do you try to adapt, and if so, how? The wine world is constantly evolving. The consideration of our techniques is perpetual. While respecting the traditions of champagne, we are interested in new techniques for the sole purpose of producing champagne that reflects the image of our house, respecting our family traditions. Then it is true that we must listen to our customers, the consumers, and respond if needed to their expectations. This is actually what happened to our rosé champagne. The popularity of this wine over several years has led us to produce more, but we have failed to satisfy all its fans, as we sadly sell out of it each year. What future do you want for the region and especially for the champagnes? Globalization, the production of wines labeled "champagne" abroad, does it bring a dangerous competition or on the contrary is it driving innovation? With a production of 320 million bottles, the Champagne region covers a relatively small vineyard area (34,045 hectares). The originality and the uniqueness of this wine do not make this region an Eden. More and more winemakers around the world sparkle with imagination in the development of new wines. Champagne is not a closed region and the "family" of winemakers is a large family. There can be no competition for those persons who consider winemaking a true art and passion that drives us still further, with humility.